"A woman should not stop thinking about supporting other women"
Nilofar Sayar, 47, a mother to five children, is the general manager of the NGO “Women and Youth Support” which carries out a number of projects in the north of Afghanistan with more than 50 staff members. She worked as an attorney in Afghanistan’s Supreme Court in the 1980s and after moving from Kabul to Mazar-i-Sharif during the 1990s, she started an NGO called Hamdard or Sympathetic, where she could support women who were internally displaced refugees in the Kamaz camp in Mazar. She arranged vocational training classes, legal counselling and more for the women. When the Taliban took power in the north she had to close her NGO, but didn’t stop supporting women. She secured another job with UN-HABITAT where she supervised a number of projects for women. “I knew it was risky and difficult when the Taliban took over, but I didn’t stop working for women, because someone had to do something for them, so I decided to continue,” she said. After the fall of the Taliban she restarted her NGO under a different name and implemented numerous projects for capacity development, small livestock projects for returnee women, a jam-making project for vulnerable women, a research study project on the lives of female carpet weavers, WFP’s food-for-work embroidery project for about 3,000 women, and a project treating women using drugs. “I’ve always dreamed of seeing women as self-reliant and making their contribution to their families and society,” she said. Springfield, Massachusetts - Bilqis Abdul-Qaadir walks quietly through the halls of the New Leadership Charter School. She is soft-spoken and polite. The youngest child of a devout Muslim family, the 5-foot-3-inch senior believes in modesty, and is determined not to call attention to herself. It is an impossible dream. Bilqis cannot help standing out. For one thing, she is the top-ranked student in her class. She wants to study pre-med in college with an eye toward being a cardiac surgeon. 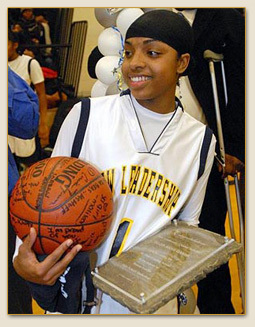 Then there is her presence on the basketball court, where she is a magnet for the eyes of all fans, and not just because she competes with her legs and arms completely covered beneath her uniform, and with a hijab over the top of her head. The point guard dazzles every night with a game that is a nonstop whir of creative fury. She darts into the lane against much bigger players, flicking in layups and reverses and hitting teammates with no-look passes. A fifth-year varsity player, Bilqis will attend the University of Memphis this fall on a full scholarship and will become the first player at a top tier Division 1 school to compete in full Muslim dress. In a speech commemorating International Women’s Day on 8 March, President Hamid Karzai challenged Afghan religious leaders to denounce violence against women and reject traditional practices that treat women as property. “The forced marriages, the selling of women — these are against Islam,” Karzai told some 600 women gathered in a high school auditorium in the capital, Kabul. Much has improved since the Taliban government ruled Afghanistan from 1996 to 2001: Millions of girls now attend school, and many women own businesses. Of 351 parliamentarians, 89 are women. On Saturday, a female lawmaker, Shalah Attah, said she will run for president in this year’s election, now set for August. But despite those advances, millions of Afghan women still face violence and traditional practices such as the trading of women as brides to settle feuds. Still, there are Afghan women passionately working for change. 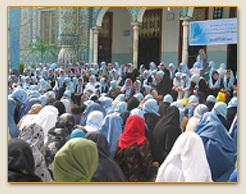 In cities across Afghanistan on International Women’s Day, groups of women donned blue headscarves to show their support for women’s rights and prayed together for peace and justice. 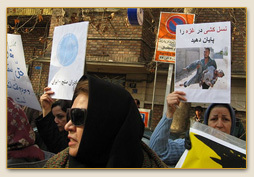 Tehran - In a year of marriage, Razieh Qassemi, 19, says she was beaten repeatedly by her husband and his father. Her husband, she says, is addicted to methamphetamine and has threatened to marry another woman to “torture” her. "We're all together in this, and it gives us the power in this struggle"
While Western governments have been worrying about bearded men with bombs in caves, a new jihad has quietly gained strength in the Muslim world: Islamic feminism. In mid-March, 350 women and men gathered in Malaysia to launch Musawah - “Equality” in Arabic - a movement for justice in the Muslim family. Organized by the Malaysian Muslim feminist group Sisters in Islam, the conference, two years in the planning, is a kick-off to a campaign to enshrine Muslim women’s rights within an Islamic framework. “We are here because we believe that Islam upholds the principles of equality and justice,” said Musawah’s project director Zainah Anwar, in her opening speech. "Canada is proud to help Afghan women"
March 8, 2009, Kabul - Canada announced on Sunday to provide 2 million U.S. dollars to support women in the war-torn Afghanistan, a press release of the Canadian embassy issued in Kabul said. “The aim of this assistance is to provide Afghan women improved access to basic services and encourage their participation in the local economy,” the press release said. The announcement of new grant on the International Women’s Day, according to the press release, will provide Afghan women with the training and support services necessary so they can become contributing members of the local economy. Canada also announced last week provision of 27 million U.S. dollars to support holding upcoming elections in Afghanistan. "Places like this are a source of harmony because Muslim and Christian women can live and work together in peace". ‘Identity, Merge and Action’ (AIM), a Catholic NGO, officially opened its 13th centre yesterday. The new facility, which already hosts 50 women, Christian and Muslim, is located in Faisalabald, eastern Pakistan. The ceremony was attended by more than 100 people. 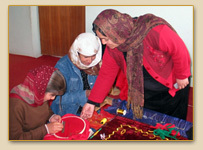 The centre provides training courses in sewing, stitching and computer literacy to poor Christian and Muslim women of the area. 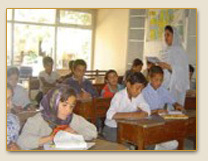 In addition, it offers health and family planning and adult education. 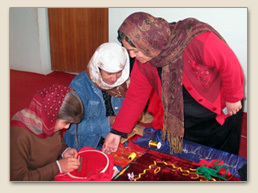 It is a place where women can learn a trade and live with dignity.